October 10, 2015 By Aileen 7 Comments This post contains affiliate links. As an Amazon Associate and member of other affiliate programs, I earn from qualifying purchases. Homemade “Swiffer” wet mop pads were one of the first things I made when I made the jump into natural cleaning. I was pretty dependent on my wet mops and would burn through 2 or 3 every time I mopped the floor. That was not easy on my budget or the environment. What really made me look at the products I was using to clean my home was after my 2nd child was born. I was suddenly very aware of her being on the ground and potentially ingesting toxic chemicals. I should have seen this as a premonition because fast forward 16 months and this girl puts EVERYTHING in her mouth. She certainly keeps me on my toes. Luckily, I don’t have to worry (as much) about her picking up a cheerio off my kitchen floor and eating it. As long as my floors are clean, I have more control about what she is being exposed to. 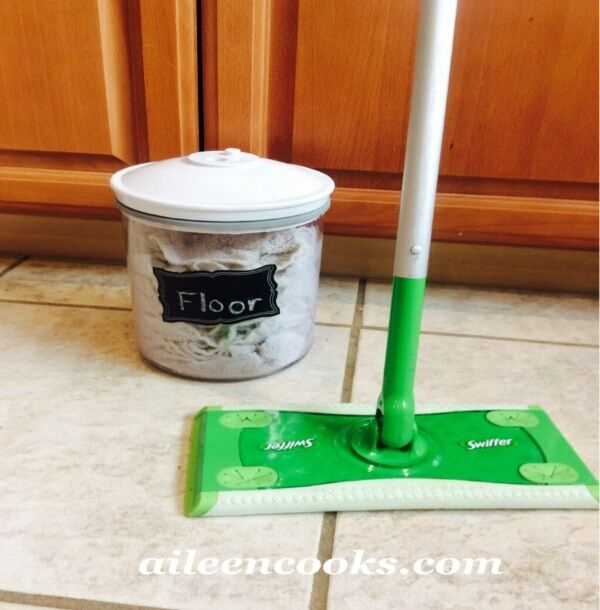 So, enter these DIY Swiffer mop pads. 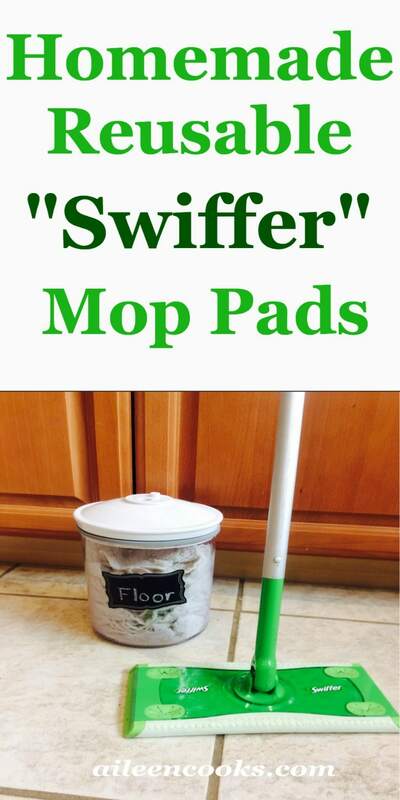 You will need a Swiffer mop or similar swivel mop or sweeper that has grips on top to grab the reusable mop cloths. 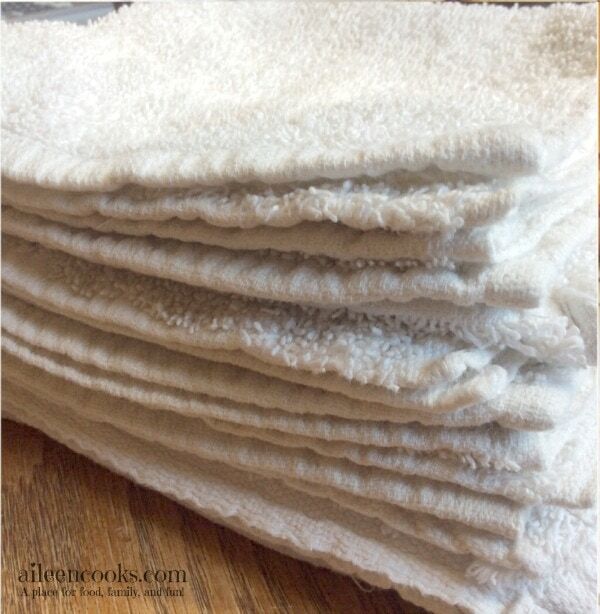 For the reusable wet mop pads, I use plain white towels cut in half (similar to these). I also use these towels for almost all of my cleaning – instead of paper towels. I have found that using towels instead of the disposable pads actually work better. The towel’s crevices scrub my floors much more effectively, so I can spend less time on my hands and knees scraping food and dirt off the ground. The cleaning solution is a simple mixture of 1 1/2 cups distilled white vinegar + 1 1/2 cups distilled water + 20 drops orange essential oil. Mix the solution together and pour over 10 towels cut to fit your mop. Store in a jar with an airtight lid. It will keep for 1-2 months. 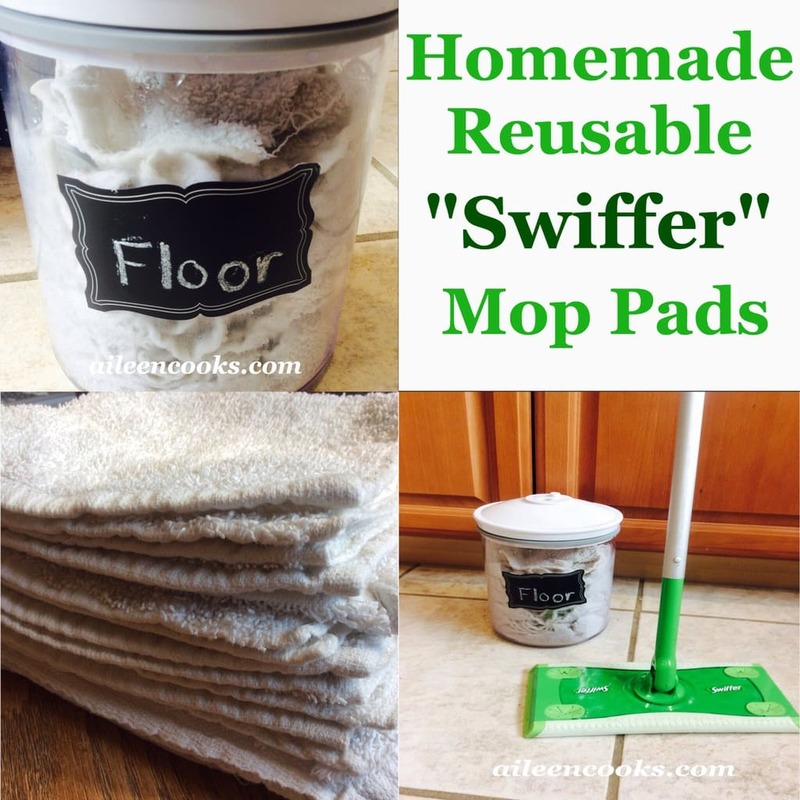 Have you made your own reusable swiffer mop pads? What did you think?